Cushion covers are undoubtedly a necessity of your sitting room. Nowadays, furnishing and décor have become an important part of people’s lifestyle. It is difficult to imagine a cushion without a cover. No doubt cushion covers add the ultimate pleasant feel, ultimate comfort and eye-soothing design to the cushion. Hence, every household prefers to buy high-quality cushion covers. There are several things people consider when it comes to buying covers for cushions. This includes material of the fabric, thread count, and price of the cover. Another important factor that everybody tries to look out for is the design of the cushion cover. Here, we shall be considering some of the available designs for cushion cover that can be found in the market. When you think of printed cushion cover, the first thing that comes to your mind is that the fabric must really look appealing. 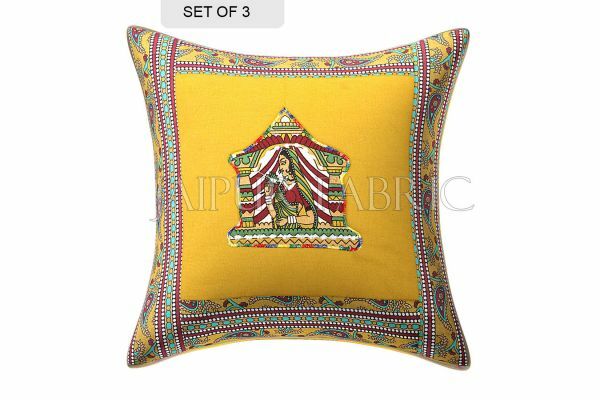 Printed cushion covers come in a variety of sizes, designs and colors such as the Blue Border Keri Block Print Cotton Cushion Cover, Black Base with Silver Gota Work Border Cotton Satin Silk Cushion Cover etc. One good thing about choosing printed cushion covers is that it allows you to opt for a design you think blends with the décor of your sitting room and also fits well on your cushion. When you choose to buy printed cushion covers, you can get all types of prints whether you want a cartoon character design or a splash of colors. Do you know that you can even get a personalized printed cushion cover in case you do not find your desired print online? Nothing can beat the essence of a Rajasthani cushion cover if you prefer elegant room décor. This kind of covers does not only blend into the background of your sitting room’s décor but also redefine luxury. While Jaipuri cushion cover can enhance the beauty of your sitting room through an exceptional elegance. 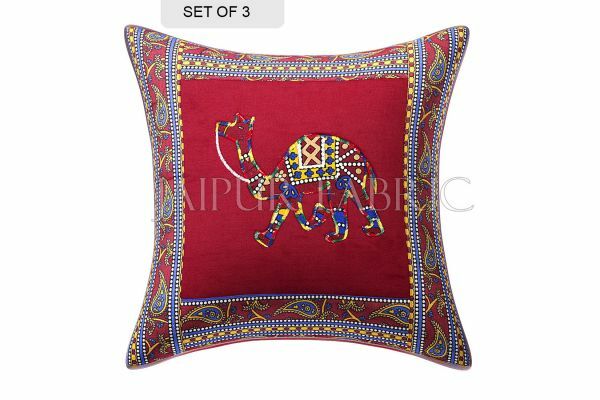 If you are looking for something with mesmerizing colors or some eye-catchy design, then go for Jaipuri cushion cover. Thread work cushion covers redefine simplicity makes the environment on which it is situated to look simple. With nothing too flashy or fancy, thread work cushion covers do not glitter yet they have got the capability to create sensational impressions of distinguishing aesthetics with the ability to add a captivating touch to your cushion. Embroidered cushion covers are one of the most versatile fabrics available for decorating a cushion. They are available in almost every variety of shape and sizes, as well as every imaginable design. Embroidered cushion covers are an ideal way to incorporate that single touch of luxury to your home. They give a special finish to give the desired sheen look and soft feel.